HP has apologised after an error on its website let shoppers buy expensive laptop computers for less than £2. One device was listed with a previous sale price of £2,378, but was “reduced” to £1.58. The computer firm briefly took its UK store offline on Saturday to resolve the error, and said it would not honour the sales that had been made. “We apologise sincerely to impacted customers for any inconvenience caused,” the firm said in a statement. Over the weekend, a handful of people posted on social media that they had taken advantage of the mistake and ordered laptops. But according to consumer rights group Citizens Advice, retailers can often cancel online orders if they have made a “genuine and honest mistake on their part that you should have noticed”. HP said buyers would be refunded. 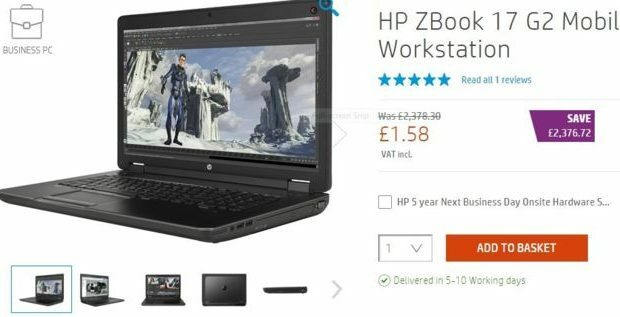 “We can confirm that due to a processing error, select products were wrongly priced on our UK website over the weekend,” HP said.